Wat Intharawihan (sometimes spelled Wat Indravihan) is located on Wisut Kasat Road on the northern edge of Banglamphu ( Bangkok ). 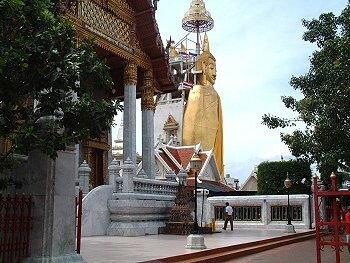 This temple is known for a huge standing Buddha image called Luang Pho To. The image, 32 metres tall and 10 metres wide, was constructed in the reign of King Rama IV. The topknot of the image contains relics of the Lord Buddha brought from Sri Lanka.